I am one of those people who needs a very long time to wake up each morning, especially in the dark mornings of winter. If I don’t have sun shining in through the window, my eyes are hermetically sealed until something very loud and annoying forces them open. This used to be my alarm clock, but lately it’s my cat Leo whining for his breakfast. Once I do drag myself out of bed, I’m not fully human until I have some coffee. Needless to say, this means my breakfasts are quite simple – usually toast with almond butter, oatmeal or yogurt. 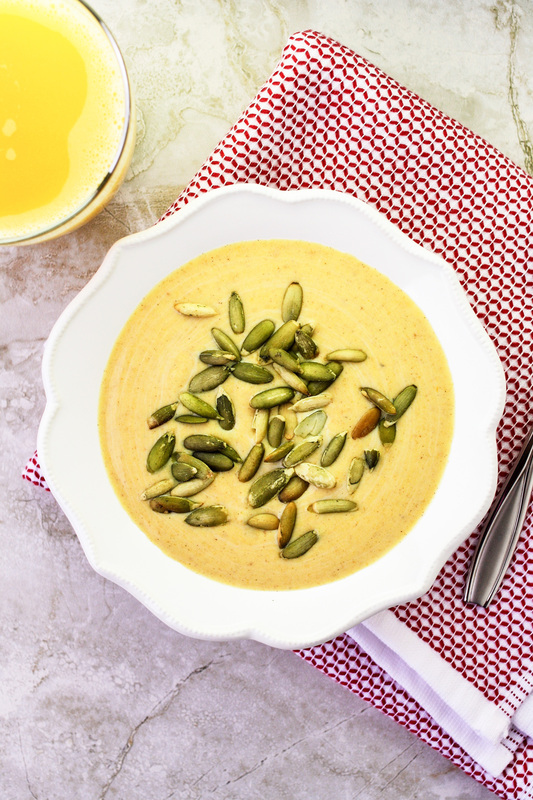 This pumpkin yogurt passed the simplicity test with flying colors: not only does it take 30 seconds to make, but it’s also healthy and delicious, almost like a pumpkin pie filling. I fully admit that when it comes to yogurt, I am a bit of a snob. I refuse to eat all of those “light” yogurts, because I can taste the sugar substitutes immediately. For this reason, I prefer using plain yogurt and then adding my own flavor and sweetener. It couldn’t be easier to do, and you’re in full control of the end result. For this recipe, I simply mix plain nonfat yogurt, a bit of canned pumpkin, some maple syrup, vanilla and warming spices like nutmeg and cinnamon. With probiotics, calcium and protein from the yogurt and vitamin A, beta-carotene and fiber from the pumpkin, this is such a well-rounded and healthy breakfast. I love adding some pumpkin seeds for crunch, but any other nut, fruit or granola would be great toppings as well. A delicious, healthy and simple breakfast made with plain yogurt, canned pumpkin and maple syrup. Use a whisk to gently blend the pumpkin into the yogurt, and then add all of the remaining ingredients. Top with pumpkin seeds. Since you only need a few tablespoons of canned pumpkin per serving, I use a can cover so I can easily use the pumpkin throughout the week. Love it! I am pretty good in the morning but often have to be at work before 7, so I like to make my breakfast the evening before. This would be perfect! Julia, as always, an excelent idea, very tasty! Thank you Silvia, I hope you like it!! I’m glad I’m not the only yogurt snob out there! I haven’t tried plain Siggi’s yet, but it always catches my eye at the store – thanks for the recommendation 🙂 And pureed roasted squash sounds fantastic for this! I hope you enjoy it! The maple goes so well with the pumpkin – it really tastes like a dessert! I’m a morning person but right now I can’t wait for the time change. I find it very hard to get up while it’s still dark out. Yogurt is my go to in the morning, so really looking forward to trying this combination. Never thought of adding pumpkin to yogurt! Thanks, Julia. I’m the same way, Geraldine – I am really struggling to wake up in the dark! I hope you enjoy this yogurt! This pumpkin and yogurt bowl looks and sounds seriously delicious.. especially love how healthy the recipe is! Definitely need to make it.. thanks for the recipe and inspiration! Thank you, Thalia! I hope you enjoy it. Healthy and delicious is a nice combination, isn’t it? Most foods fit into one of two categories: sinful but so tasty they’re worth it or flavorless with enough health benefits to guilt-trip us into including them. Looks like you’ve hit on yet another that’s the best of both worlds. Anything that tastes like pumpkin pie filling and has a fun bit of crunch besides is bound to be great! Why thank you! Tasteless healthy recipes will never be found here (or at least that’s the goal). I bet it would be good with some of the granola you like to have. Tried this one yesterday morning and can now speak with some authority: it’s light, healthy and delicious with just the right level of sweetness. I may have gone overboard with the pumpkin seeds, but loved every crunch. 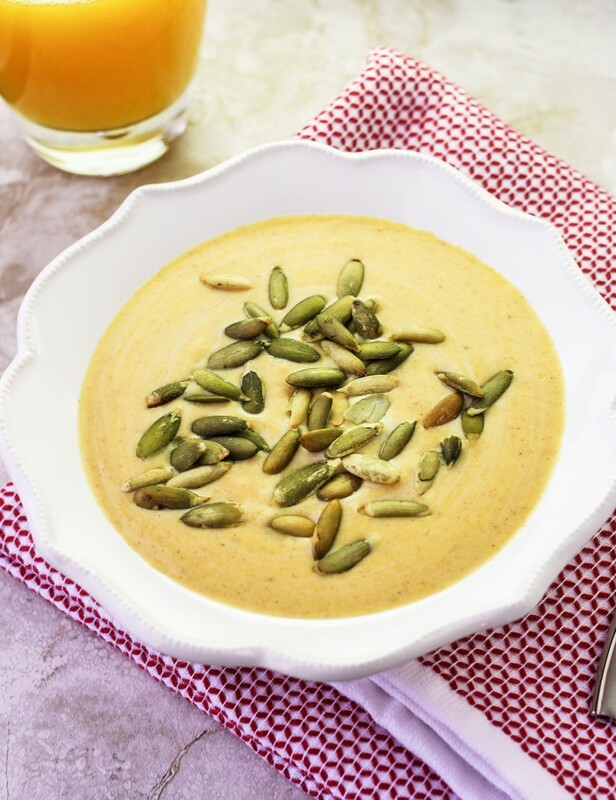 The thought of pumpkin with yogurt is mouthwatering! What a lovely combination! I’m pretty stuck on green smoothies in the morning, but am in need of a change to shake my morning breakfast routine up. This will be just lovely! Thanks, Julia! BTW – have you tried Noosa Yogurt? It’s gooooood!!! Thank you, Traci! I tend to get in breakfast routines too – this is a fun and easy way to break out of the rut. I haven’t tried Noosa yogurt, but I will definitely be on the lookout for it now! Now this is just brilliant! Why didn’t I think of this?? I love it when I find healthy pumpkin recipes instead of the typical pies and muffins. This is awesome. Thank you, Kate! I agree – it’s nice to use pumpkin to make something healthy once in a while. The best part about this is that it tastes like a dessert, thanks to some maple syrup, nutmeg and cinnamon! I hope you enjoy the recipe. After enjoying the latest batch for breakfast for the past couple of mornings, I thought I should compliment you officially on this perfect yogurt creation! There is so much flavor from the pumpkin and just the slightest bit of sweetness from the maple syrup. It is not loaded with sugar, as so many yogurts are. I have quite a bit of pumpkin left in the can so I will be enjoying this breakfast treat for a while! I am glad we got to enjoy this yogurt together last week! I don’t know if I can ever go back to all those sugary yogurts – once you know how easy it is to make your own flavored yogurts, you can’t go back!